Douglas Kim is one of the youngest successful poker players around, having been born November 10, 1983 in Yonkers, New York. 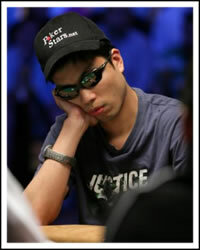 Douglas Kim is a Korean-American who had his one and only poker success at the 2006 World Series of Poker Main Event, where he finished in seventh place. Douglas bears the unique honor of being the only player at the 2006 WSOP Main Event final table who was not eliminated by Jamie Gold. Instead, Douglas Kim was eliminated by Paul Wasicka. Douglas’s seventh place finish earned him nearly $2.4 million. Douglas Kim graduated from Duke University in 2006 with a degree in economics. He currently works as a strategy consultant for Mercer Oliver Wyman in New York City. Douglas primarily plays at online poker rooms, and when he isn’t working or playing poker he enjoys playing his guitar and playing his video games. Douglas Kim lives in Hartsdale, New York.